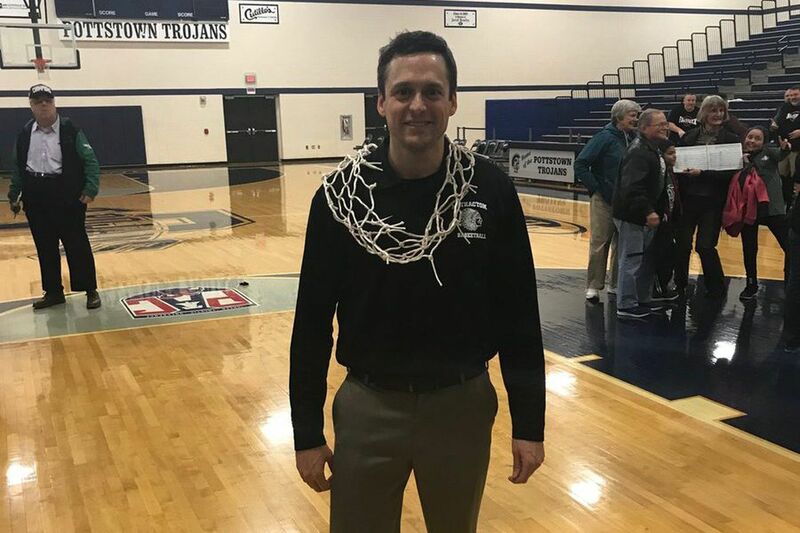 Methacton boys’ basketball coach Jeff Derstine celebrates his team winning the PAC title. David Duda poured in 38 points as the Methacton boys' basketball team won the Pioneer Athletic Conference title with a 72-60 victory over Spring-Ford on Tuesday. Jeff Woodward filled the stat sheet with 17 points, 19 rebounds, and four blocks. The Warriors will face Perkiomen Valley on Friday in the District 1 Class 6A playoffs. The Rams start the tournament with a game against North Penn. Steve Payne's layup with 2.6 seconds left gave Lower Merion a 48-46 triumph over Penncrest in the Central League final. Payne ended with 18 points for the Aces, who captured their second straight Central League playoff championship. Tyree Corbett led a balanced attack with 14 points as Lincoln held off Mastbaum, 85-50, in Bracket B of the Public League playoffs. Elsewhere in Bracket B play, Ricardo Montereiro's 17 points gave Martin Luther King a 73-69 win over Boys' Latin. Donte Dupriest scored 22 points as Bartram defeated Paul Robeson, 73-49, in Bracket A of the Public League playoffs. Dahmir Fowlkes added 13 points and 12 rebounds. In other Bracket A action, Scott Spann's 23 points lifted Sankofa Freedom over Overbrook, 64-52. Deuce Turner finished with 18 points in Malvern Prep's 73-43 triumph over Springside Chestnut Hill in the first round of the PAISAA tournament. Isaac Marshall poured in 34 points as Academy of the New Church beat Barrack Hebrew, 65-22, in a PAISAA play-in game. Masai Olowokere had 19 points as George School secured a spot in the PAISAA tournament with a 54-46 win over Germantown Friends. Arion Lewis scored 23 points and Valley Forge Military Academy defeated Plumstead Christian, 74-46, in the Bicentennial League playoffs. Abraham Deng ended with 14 points and 16 rebounds. Cole Johnson notched 42 points and 15 rebounds as West-Mont Christian beat Upper Bucks Christian, 63-57, in the ACCAC playoffs. Mason Barth paced Upper Bucks Christian with 23 points. Jordan D'Ambrosio's 14 points helped Springfield (Delco) upset Garnet Valley, 51-46, in the Central League final. The Cougars prevented the Jaguars from winning a fifth straight league title. Springfield will play Penn Wood in the first round of the District 1 Class 5A playoffs. The Jaguars have a first-round bye in the Class 6A tournament. Anna Camden netted 21 points as Shipley cruised past Agnes Irwin, 62-29, in the first round of the PAISAA playoffs. Next up for the Gators is Westtown, which took down George School, 38-27, behind 12 points from Emma Diaz. Casey Remolde scored a game-high 19 points as St. Basil won its second consecutive Athletic Association of Catholic Academies title with a 38-35 victory over Villa Maria. League MVP Paige Lauder had 18 points in defeat. Ceili Corduff and Jamia Davis each had 14 points as Lower Moreland beat Bristol, 48-39, in the Bicentennial League Independence playoffs. Natalie Kolb and Jennifer Kremp scored 17 and 15 points, respectively, as Jenkintown got past Faith Christian, 64-24, in the Bicentennial League Constitution playoffs. Nyjah Moody recorded 10 points to lead New Foundations past Mercy Career Tech, 28-20, in the Penn-Jersey League semifinals.